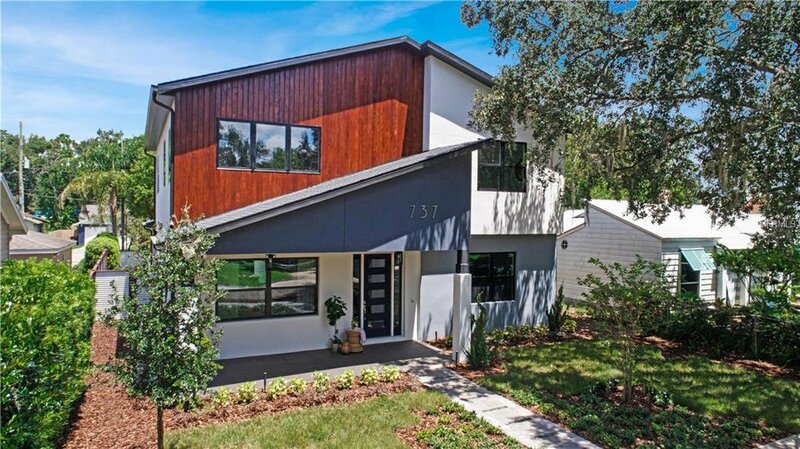 **PRICED TO SELL/OWNER IS MOTIVATED** Are you looking for chic, modern living close to Downtown Orlando! Look no further; this beautiful, brand new home nestled in College Park is ideal! The combination of textures and colors offers incredible curb appeal to this custom home. The interior offers an open floorplan with a living room/dining room combination and open kitchen, making this home great for entertaining. No detail was spared on the interior either, with dark wood floors, neutral colors and modern textures throughout. The first thing that will catch your eye are the high ceilings open to the upper floor, lined with windows for an incredible wash of natural light. The kitchen features modern cabinetry in mixed wood colors and ultra modern drawer pulls and backsplash tiling. A downstairs Master Bedroom is highly desired feature and this home does not disappoint. The large Master Bedroom is on the first floor and the Master Bathroom suite will definitely make you feel like you are living in luxury. The extended countertop offers lots of storage along with an oversized shower and modern, soaking tub. There is also a separate dressing area off of the Master Bathroom. Head upstairs for an open loft area, great for a sitting room or home office and the other 3 Bedrooms and 2 Bathrooms, all offering beautiful textiles. The garage is around the rear of the home, along with a beautiful porch area and fenced in yard. This home will not last long, schedule your showing today! Listing courtesy of WATSON REALTY CORP. Selling Office: COLLADO REAL ESTATE.